Adult children living at home. It’s the premise for many a zany Hollywood comedy. Men in their ‘30s or ‘40s living with their mums, modern city families having to move to their parents’ country homes, houses packed to the rafters with multiple generations. Surprisingly, it’s the reality for a number of Australian families. Retirees looking forward to comfortable, leisurely lifestyles are suddenly saddled with the responsibility of children, dependant grandchildren, and all the associated financial complications. While it can be great to have family around, it is also a real financial burden. But the alternative is letting them fend for themselves – an idea no parent would be comfortable with. How does this happen? There are a number of circumstances that could see your otherwise very successful, grounded children left with nowhere to turn. The accidental death of a partner or a long term illness or disability. Even the loss of a family business or a sustained period of unemployment. The good news is that there’s a way to ensure these unforeseen circumstances don’t impact your retirement lifestyle. It’s simple – insurance. 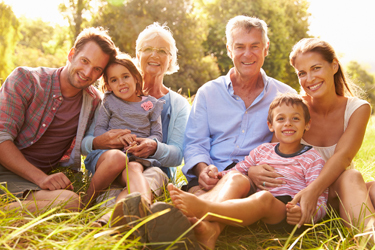 Making sure your adult children are adequately insured is the easiest way to take care of them, whilst also safeguarding the retirement lifestyle you’ve worked so hard for. The right level of insurance can see a young couple or family maintain their standard of living and get back on their feet after the death of a partner or spouse. It can cover living expenses including (but not limited to) mortgage/rent payments, utility bills, education expenses, groceries, and more. The problem is that, to put it bluntly, young people consider themselves invincible. Or at least, they don’t take the risk of death seriously. Your children may have little to no life and TPD (total and permanent disability) coverage, except perhaps through their super. Getting their life insurance sorted should be a top priority. Then, there’s health insurance. Again, many young people don’t have adequate coverage because they don’t see the need while they are free of chronic conditions. However, in the case of a severe accident or acute illness, their policy may not cover all their treatment. And (on its own) it won’t make up for a loss of income. An emerging concern for Gen Ys and millennials is the way that a serious injury or illness can impact their career path and earning potential. For example, statistics show that despite safety campaigns, more young people than ever are hospitalised after road accidents.i If your child were to need significant time off work due to unforeseen circumstances, how would their living expenses be covered? If you don’t want to pick up the tab, income protection insurance may be a suitable option for them. It can be difficult to start talking about insurance with your adult children, especially if they’re wholly independent and you don’t generally discuss money matters with them. To get started, be upfront with what you want to talk about, so the discussion stays focused. It’s easy to be side-tracked by emotional issues, complications of estate planning etc. Let them know you’ve decided to start this conversation now because you’re in the midst of your own retirement planning. At the same time, make sure they understand that you respect their independence, but that you want peace of mind for their future. If the cost of premiums is an issue, you may find it cost effective to help them with this expense. Alternatively, you can make a joint appointment with us to discuss insurance strategy. Afterwards, you’ll both feel all the better for having secured your retirement and their financial future.